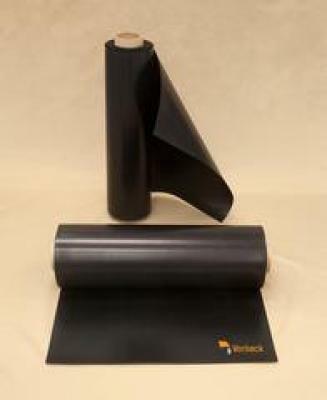 Vorbeck Materials is a US company developing graphene-based solutions based on their Vor-X single-sheet graphene. Vorbeck develops and offers graphene-based inks (such inks were used the first ever graphene-based product, the Siren anti-theft packaging device. ), composites, coatings and graphene-enhanced batteries. Vorbeck also develops graphene-based batteries. The Vor-flex 50 is planned to be the first in a new family of graphene-enhanced, engineered elastomer products made using Vorbeck’s proprietary Vor-x technology. Vor-x provides Vor-flex 50‘s hydrogenated nitrile butadiene rubber (HNBR) with extreme strength at low deformation (high modulus) and the ability to withstand temperature spikes up to 200 ⁰F above the rated working temperature of HNBR. Vor-flex 50 has a nominal tensile strength of 3500 psi and a Shore A hardness of 88. Vorbeck Materials, a leading producer of graphene and graphene-based products, has signed a joint development agreement with Reliance Industries, one of Asia’s top petrochemical production companies. The two companies will each be using its unique expertise to develop graphene-enhanced synthetic elastomer products. Vorbeck Materials entered into a strategic investment and technology development agreement with In-Q-Tel, an independent strategic investment firm that focuses on innovative technology solutions for the US Intelligence community. As part of the agreement, Vorbeck will adopt its graphene technologies and develop conductive compounds for IQT's customers. Vorbeck Materials announced the Vor-Power straps, a light-weight flexible power source that can be attached to any existing bag strap to enable a mobile charging station (via 2 USB and one micro USB ports). The Vor-Power strap weighs 450 grams and provides 7,200 mAh. And it's probably the world's first graphene-enhanced battery. The Vor-Power strap is also very rugged - it is water resistant and can survive a drop of over 24 meters. You can pre-order it now for $89.99 (the regular price, after July 15, will be $129.99). 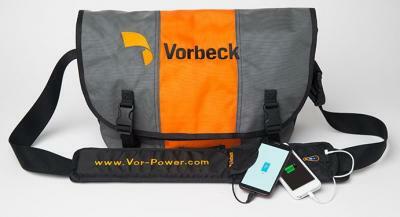 Vorbeck will ship this product by July. They also offer custom versions with your logo or marketing message.